Down in the plain is the People of Israel, and they are becoming fearful. Moses has been up on the mountain quite a long while - because it turns out things are a little more complicated than just ten handy commandments. He has been gone an awfully long while, this Moses fellow, forty days and forty nights, which is a long time to be without a leader when you and your parents, and theirs and theirs and theirs, have spent four hundred and thirty years as subjects to Pharaoh in Egypt. So the people say to Aaron, their putative priest, 'Make us a God!' That is, give us something to see, something we can point to and be certain of and sure. 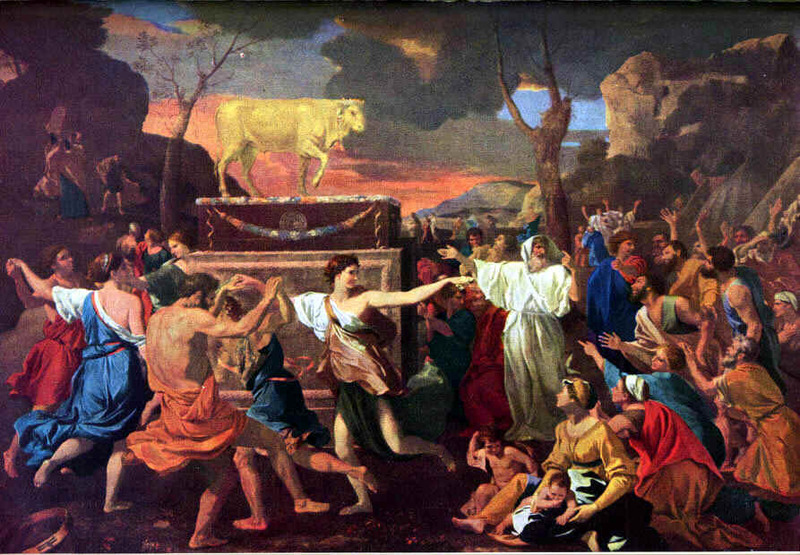 And Aaron - we know the story - takes their bangles and their earrings and makes a golden calf. And what is so striking - but so easy to miss, when the story (Exodus 32:1 - 34:17) is told at full, majestic length - is that what Moses asks of God up on the mountain is exactly the same thing that the people demand from Aaron in the plain below: Show me God! Let me know my Lord exactly. God being God, the answer Moses receives on the mountain is infinitely better than the material response Aaron provides for the people in the plain below. God says to Moses, No, I am not going to become some thing definite for you, like a statue you might walk around and know to a tee. And when God says to Moses, "for man shall not see Me and live," (Exodus 33:20) perhaps the meaning is less that a face-to-face encounter with the Divine would zap a human being and more that if one were certain, if one knew for sure, what would be the sense of being alive? Living is searching, striving, yearning. Living is not knowing. Living is questing to know that which is beyond, and beyond that, and beyond - and in that sense, "man shall not see Me and live" - a human being cannot presume to grasp the Ultimate and at the same time be truly alive. But what I'll do, says God to Moses, is I'll do this: I will shelter you here, in the cleft of the rock, beneath the palm of My hand, and I will pass by you, and you will know that you have not been here alone, and I will be what I will be to you - but, no, you won't see exactly what I am. I am so grateful that, when I was a child, and I asked the big questions, my parents had the courage to tell me, at three and four and five years old, that nobody could know. But here were stories, and searches, and ideas, and great thoughts - and I think, in no small part, that is the reason my journey still is a spiritual journey, and my yearning still is spiritual yearning, and, ultimately, why my soul still thirsts for the living God. If I had been given spiritual pabulum, or had I been told that the stories were the way things actually were, I think I would have come to just as definite negations. I would have put away childish things - and I don't think that is being alive either. I think that is also why I love Talmudic tradition, its constant back and forth of proposition, and question, and counter-question, which, in its truest heart of hearts, does not really desire end-points, though it delights endlessly in seeking them. There is something stony and idolatrous about answers settled upon, try to stamp them as we may with divine imprimatur. We are living creatures. We are made to be dynamic through and through. "When we have found all the mysteries and lost all the meaning," says the despairing tutor of Tom Stoppard's Thomasina, in his stage-play, Arcadia, "we will be alone on an empty shore." "Then," answers Thomasina, "we will dance." So long as we are alive, no discovery, however penetrating or demystifying, will dull our taste for the ineffable, unknowable source of our joy, and of our seeking, and our life. This is a place of knowledge, this Harvard, this magisterially earthly University; and it is sometimes tempting for religion to compete on that playing field, even to claim victories. I suggest, by contrast, that the role of those of us in the Spirituality within the University is not to have all the answers, but to remember the questions - the very big questions. And so I pray that we be not so sure - that we not content ourselves with the idols that are ideas set in stone. I pray that we have the courage to shatter certainty, and to recognize that truth is scattered like refracted light among us all, reflected by each of us distinctly and differently, and incomplete in the scope of any one of us - and that we delight, therefore, in discovering one another, and in searching ever onward with one another. There could hardly be a better place than a great University in which to continue that essential story.